Over the last several months we have been highlighting some plants in Nature Notes that are “bird friendly.” This is part of a statewide effort among Audubon chapters to encourage folks to use native plants in their gardening and landscaping that are of particular benefit to birds. So far we have had short articles on milkweeds (April issue), Serviceberry (May issue), Virginia Sweetspire (June issue), Purple Coneflower (July issue), and Black-eyed Susan (August issue). Each time we have given a bit of information about Audubon NC’s Bird-Friendly Communities project as background. 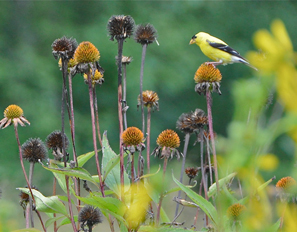 In this issue it seemed like a good idea as we begin our new program season to explain exactly what is meant by the term “bird friendly” plant. Humans use plants for lots of different purposes in lots of different ways. We know that not all plants are created equal for our purposes, and the same is true for birds. Birds use plants as a source of food, either directly by eating the buds, fruits, seeds, and so on, or by eating insects and other organisms that are attracted to the plants. Birds also use plants as structural sites (limbs, leaves, cavities) as nest sites to raise their young. Further, birds have learned which plants provide the best shelter from predators and weather. Almost always a native plant provides for more of a bird’s needs than a plant that has been brought in, either accidentally or on purpose, that didn’t exist here before humans arrived. The best evidence that archaeologists have at this time suggests that there were few or no humans in what we now call the Triad before around 13,000 or 14,000 years ago. Consequently, it’s convenient to think of “native“ plants as having been here for thousands of years. During that time, birds and other creatures have adjusted their lifestyles to take advantage of these native plants. When non-native plants have been brought in during the last few hundred years from Europe, Africa, Asia, or elsewhere, local birds and other creatures are at a disadvantage because they don’t know how to make use of them. A really dramatic example is that insect-eating birds can find eggs, larvae, or insects of more than 500 insect species on native oak trees, while our common non-native landscaping tree, crepe myrtle, has almost no food value for our birds. Consequently, if we like birds and want them to survive in our neighborhoods, it makes sense to have the plants that provide for the largest number of their needs. For the gardener and home landscaper, the good news is that native plant species tend to do better in our soil, temperatures, humidity, and other conditions than the non-native plants from places that have different conditions. There are other considerations to think about as well, but we don’t have room in one newsletter article to discuss them. Later we will talk about such things as “exotic” plants and “invasive” plants and their effects on birds. In the meantime, it’s worth repeating that our beloved Triad birds benefit immensely from having native plants in our lawns and gardens. In fact, these native plants may save their lives. 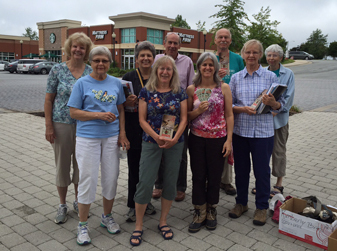 Audubon North Carolina is actively recruiting volunteers for the Audubon Ambassadors program. If you care about birds and our environment, consider joining the hundreds of supporters who are committed to help protect our birds. Learn how you can help change the bleak outlook for birds, our communities, and future generations. Without a groundswell of support, many of our most beloved birds could be gone within our children’s lifetimes. Audubon’s Birds and Climate Change Report has put a spotlight on this urgent message. The time to act on climate change is now. Audubon Ambassadors are a special group of trained volunteers armed with the necessary tools to share the urgent message about our birds and to help shape the conversation on climate change in North Carolina. Birds will only survive with our help, and the more people who get involved, the greater collective impact we can have on climate change. Lots of small, collective actions will add up to a brighter future for our birds and our communities. 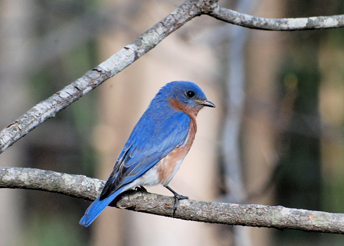 The Audubon Lake Daniel Bluebird and Brown-headed Nuthatch trail boxes were well-inhabited this year from March 15 until Aug. 21. The boxes were checked weekly during the period by Westerwood neighbors and Auduboners: Sue Cole, Emepa Pampo, Everine Manunga, Pam and Roger Spell, and Stella and Tom Wear. Volunteer Griffin James kept the vines, weeds cleared around Box 3, which is the box most inhabited each summer. Bluebirds laid 37 eggs with 33 fledging. Other cavity nesters were the Brown-headed Nuthatches laying six beautiful eggs in a bluebird box. Something happened to the parents, leaving the eggs not viable. The usual other occupants were the Carolina Chickadees and House Wrens, laying and fledging 13 birds. The wrens started nests and abandoned them several times, typical behavior. We will ask for volunteers to replace baffles on several of the poles when the weather cools. Tools needed include drills with fairly large bits, pliers, and willing hands. Materials will be furnished. Dabney is Project Manager for the Downtown Greenway, a $30 million, four-mile loop around downtown. She will update us on the progress of the Greenway and how this will put some green back in Greensboro. Her presentation will include slides of the project and she will tell us why it is being built, how it all got started, how much has been built, and what we can expect in the future. Madeleine is trails coordinator for the City of Greensboro. She is responsible for the 60 miles or so of trails in and around the area, and wants us to know that we don't have to travel hundreds of miles to enjoy hundreds of miles of trails. From the Lake Daniel Hiking/Biking trail to the A&Y Greenway to the Bicentennial Trail to the 40 miles of trails around Greensboro's reservoirs, we can take many an outing before returning to the same trail. 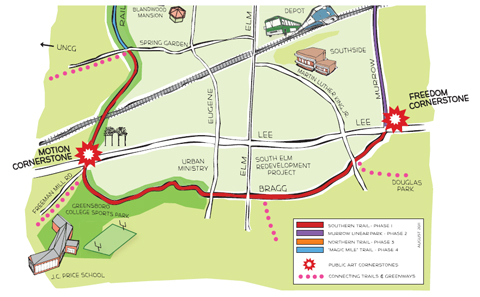 This integrated trail system will only get better, and Madeleine will update us on plans, especially about the Lake Daniel-Latham Park trail which is slated to go through the Audubon Natural Area and on to the Revolution Mill complex. This first fall program is one of three that were deliberately chosen to fit into the One City One Book series of events built around Bill Bryson's book, A Walk in the Woods. Our two speakers will talk about walking both in the woods as well as downtown. This is a fitting start to our 2105-2016 program year. Please plan to join us and learn about the many wonderful trails and greenways in and around Grteensboro that we are so lucky to have. Carpooling: Meet at 1:45 p.m. in the Whole Foods parking lot, near the Sears Plaza sign, 3202 W. Friendly Ave. The Greenway is being built in sections as funds become available. We will walk the first section that has been completed, which runs from Eugene Street to Gate City Boulevard. (the new name for a portion of Lee Street) and on to Spring Garden Street on the old Atlantic and Yadkin Railroad right-of-way. This section terminates (or begins) at Morehead Park where benches, art work, and the colorfully painted Spring Street overpass brighten the scene. Also located in this section is one of the two completed Cornerstones, called "Motion," which recognizes the role of education in our city. We will start our walk at Morehead Park, stroll down to Eugene Street, and return. If time permits we will drive over to Smith Street to check out another section of the Greenway and the second of the four planned Cornerstones to be completed, "Tradition," where a variety of native plants and fruit trees have been planted to form an urban orchard. Please plan to join us on this urban walk on the Greenway. Gather at 1:45 at the Whole Foods parking lot in Friendly Center near the Sears Plaza sign along Friendly Avenue. We will plan to leave at 2 p.m. and to be back at Friendly by 5 p.m. This walk is ideal for supervised children, so bring the whole family. This is also Grandparents Day, so bring the grandkids and the grandparents. Attention, all you litter pickers out there. It’s time for Greensboro’s annual fall stream and street cleanup, BIG SWEEP. For TGPAS folks that means cleaning up litter from the Audubon Natural Area. We’ll “sweep” along Tankersley Drive, and the parts of North Elm and Church streets that border the ANA. And if “the creek don’t rise,” we’ll also walk along the banks of North Buffalo Creek to “delitter” that part of the Natural Area. We’ll provide gloves and trash bags from Greensboro Beautiful, which sponsors the yearly cleanup. Wear long pants and sturdy shoes, and if you are one of those intrepid litter pickers who want to wade into the creek, wear old tennis shoes or ones that can get wet and provide protection. After the cleanup we will go over to the trash drop-off site for pizza and drinks. The Audubon Natural Area is on Tankersley Drive on the north side of the Moses Cone Hospital campus, between Elm and Church streets. Please email Jim Eldrett at mooose55@msn.com or call 336-609-0070 for more information and to let him know that you will participate. It’s a little bit of work and a lot of fun. The fall migration should be getting started, so we’ll likely see some good birds while tidying up the Natural Area. And there should be some nice late-summer wildflowers showing up there too. So please help to keep our Natural Area a pleasant place to visit. Thanks. The Blue Ridge Parkway (BRP) in late September is a beautiful place to end our summer fun of watching birds and other wildlife and welcome the beginning of autumn. Again this year, we will make the short journey to the BRP on the last full weekend of September. We hope you’ll join us for a fun field trip on Saturday, Sept. 26. 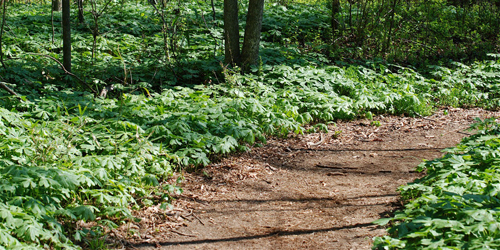 This outing is for naturalists of all kinds, no matter where your interests lie. The date is near the peak of migration for hawks. It also is prime time for Monarch migration, and these beautiful and interesting butterflies tend to follow the BRP on their journey south to Mexico. Late summer wildflowers will be blooming in profusion. Some of the leaves will have begun to take on autumn colors, too. There will be something to see for just about everyone. We will begin our day on the BRP at the Blue Ridge Music Center at Milepost 213 just inside Virginia. Meet at 9:30 in the center's parking lot. We’ll look for birds, butterflies and wildflowers around the grounds. If we find a lot to see and linger until lunchtime, we’ll have our bring-your-own picnic at the center. Be sure to bring food and plenty to drink. From the music center we will work our way slowly southwest along the BRP toward Sparta, stopping along the roadside periodically to check flowering meadows and woodland edges. We won’t do much hiking; it will be a drive-and-stop kind of trip. If we have time and there is interest, we could continue on to Doughton Park. This trip is open to everyone, so bring family and friends, including older children. (No pets, please.) We are inviting the Piedmont Bird Club, the Carolina Butterfly Society, and the NC Native Plant Society on this trip, so there is sure to be a wealth of knowledge and expertise for nearly every area of interest. What to bring: There are rest rooms and water at the Blue Ridge Music Center but no facilities beyond there. Bring snacks and food for picnic lunch, and be sure to bring plenty of water. Wear sturdy shoes and a hat, and you may need a sweater early in the day. Bring field guides that suit your particular naturalist interests and any field equipment you like to use such as hand lens, binoculars, and scopes. DO NOT bring nets for butterflies and dragonflies. No collecting of specimens of any kind is allowed on the BRP. However, photography is welcome and there should be plenty of photographic opportunities. Cancellation: A little early morning fog and drizzle won’t deter us, but the trip will be canceled if the forecast is for inclement weather all day. Check the forecast for Sparta, NC, before departing from the Triad. If you would like to arrange carpooling, need specific directions, or have questions, contact the trip leader, Dennis Burnette, deburnette@triad.rr.com. 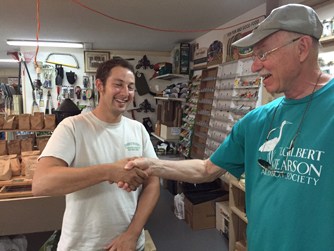 TGPAS Chair Jack Jezorek (at right) explains Bird-Friendly Native Plant Program to Ralph Soviero of Soviero’s Tri-County Garden Center in High Point. Soviero's is one of the garden centers committing to selling native plants. T. Gilbert Pearson Audubon Society members were among the first to join the statewide initiative of Audubon North Carolina’s Bird-Friendly Native Plants of the Year program with a day-long blitz aimed to acquaint local growers and retailers about the benefit of native plants. Ann Walter-Fromson, coordinator of TGPAS Bird-Friendly Communities Team, spearheaded the campaign. Eight members met on Aug. 19 in Greensboro, with Kim Brand, Audubon NC’s Bird-Friendly Communities Coordinator, for a strategic overview before heading to local nurseries and growers throughout the Piedmont. “We need everyone in the state to buy native plants conveniently,” added Kim while showing a chart detailing more than 400 native plants. “Bird-Friendly Native Plants of the Year” are outlined for 2015, 2016, and 2017 so that growers and gardeners can add to their collections annually. Cultivars are acceptable, and the selection highlights food sources throughout various seasons which ensure bird survival. Four teams of volunteers were assigned to visit nurseries and retailers. The purpose of the blitz was to encourage participants to commit to the program for the next three years. Benefits include promotion on Audubon sites, in addition to Audubon-supplied free brochures available for consumers. There is no cost for participation. NC Audubon will supply “I’m Local” tags to display on bird-friendly native plant materials. Later this fall, a 18 in. x 24 in., four-color poster will be available. “We’re still hearing from nurseries, growers, and landscapers.," Ann said. "Thanks to the blitz, we added seven businesses to the list of existing participants, and six more are strongly considering participating. Positive responses included requests for TGPAS to provide programs about birds." "At the Guilford Garden Center, the owner said she gets requests for natives, especially Spicebush, and the Audubon program is driving that interest,” reported Kim. Funding for the Bird-Friendly Native Plants of the Year program was provided in part through an Urban and Community Forestry Grant from the North Carolina Forest Service, in cooperation with the USDA Forest Service, Southern Region. Kim noted the blitz served as an outstanding example of the Audubon NC and chapter collaborations. “I am deeply grateful for the team efforts,” she added.